Although the Oriental is relatively a small breed section, there has been some fabulous wins at the Supreme. The oriental, has the elongated foreign type, of the Siamese, and their coat should be short and glossy. They come in numerous colours, including silver, and a variety of patterns. There are over 2 hundred different colour schemes, and the Angora is the Oriental long hair. The Oriental is an extrovert, very people orientated, and likes nothing more than being part of the family. My Orientals are extremely loving and demonstrative. They can be taught quite easily, to retrieve a scrunched up piece of paper. The Siamese, has a special look, which is appreciated by breeders, and pet owners alike. There are 2 known body types, modern and traditional; the first being the only one, most cat fancy organisations recognise. Modern Siamese, is the type of Siamese, seen at most cat show. It is easy to distinguish, with its, long svelte body type, large ears and its wedge shaped head shape. Traditional (Appleheads)Siamese, are more muscular in body shape, with a rounded head shape and less extreme look. All Siamese, share the colourpoint pattern, where the cooler body parts, (face, tail, legs) are of a darker colour, than the rest of the body. Kittens are born without dark markings, and develop these as they grow older. Duen Ngai, d.o.b. March 1885. Kalohom and Khromata, d.ob. July 1885. Owner Mrs Lillian Velvey. Exhibited at 17th Crystal Palace Cat Show, October 1885. Tiam O'Shian IV, circa 1900. Prizewinner, Crystal Palace Cat Show, 1900 and 1901. In 1884, the Siamese King, gave Mr Owen Gould, the departing Consul-General, a pair of Siamese cats, as a gift (Siam is now known as Thailand). Mr Gould, considered it a great honour, since the cats, came from those bred, in the Royal Palace, in Bangkok, by the Royal family. At that time, Siamese cats were held in such high exteem, that only the King and members of the Royal household, could own one. Afterwards, Mr Gould presented them to his sister, and the progeny of the pair of Siamese, were exhibited the following year, at Crystal Palace, in 1885. Mrs Velvey, subsequently became one of the first members of the Siamese Cat Club, when it was founded in 1901. Between 1884, and the end of the century, a considerable number of Siamese were imported into the United Kingdom. During 1886, a pair of Siamese cats and 2 kittens, were imported into Britian, this time by a Mrs Vyvyan. 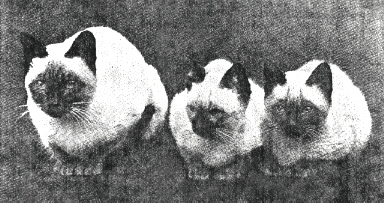 Miss Forestier Walker, a founder member of the Original Siamese Cat Club, owned Tiam O'Shian, an ancestor of Tiam O'Shain IV, who was a prizewinner, at London Crystal Palace Cat Show, of 1900 and 1901 (pictured above). The first champion, 'Champion Wankee', was born in Hong Kong in 1895, and was owned and shown, by Mrs Robinson, in 1898.